Nasal congestion (or a blocked nose) can make you breathe through your mouth instead of your nose which may cause snoring and a bad night’s sleep for you and your partner. Breathe Right Nasal Strips gently open your nasal passages helping you to breathe better by providing temporary relief from nasal congestion and stuffiness which can be caused by colds and allergies. Each drug-free nasal strip consists of flexible “spring-like” bands that when placed correctly across the nose, gently opens the nasal passages to make breathing easier. 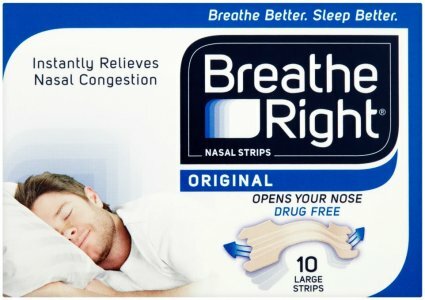 Breathe Right Nasal Strips are drug-free adhesive strips with a unique reflex design that are proven to instantly relieve congestion and reduce or eliminate snoring. 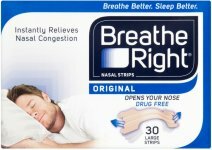 Once applied to the nose, Breathe Right Nasal Strips work by gently opening nasal passages allowing you to breathe through your nose instead of your mouth. Thereby relieving congestion, reducing or eliminating snoring and helping you breathe more easily while you sleep. Regular works best for most adults and fits 75% of adult noses. Large is recommended for adults with larger noses. How well we sleep at night has a significant effect on our ability to concentrate and perform during the day. And for people whose sleep is regularly interrupted by snoring or congestion, the impact can be significant. That's why millions of people around the world use Breathe Right Nasal Strips for a better night's sleep. 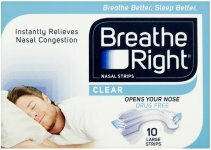 Drug-free Breathe Right Nasal Strips open nasal passages so you can breathe through your nose instead of your mouth, reducing snoring. So, you can breathe better, sleep better, and feel better. And that's a great relief. The main problem with snoring is that it may disrupt your sleep, and possibly the sleep of your bed partner. This can cause problems in relationships – around 80% of snoring couples periodically sleep in separate bedrooms and almost 9 in 10 say their relationship would be better if the snoring was solved. The lack of sleep makes you tired the following day and may even affect your work performance. You know what it's like to put up with a blocked nose. Not only is it hard to breathe, but it also makes it difficult to get a proper, restful sleep. So, the next day we feel tired and unable to work as well as normal. Sleep also plays an important role in helping us recover from illness. At night, your blocked nose can make it hard to breathe, leading to problems sleeping. Almost half of allergy sufferers experiencing nasal congestion say it affects their ability to work or do other activities . So, something as simple as a blocked nose actually has a major impact on your quality of life. Place nasal strip across your nose so the nasal passages are pulled open.